The industrial look is making its way into homes more and more, giving a nod to large 19th century factories that were abandoned and turned into purposeful spaces for various creatives. 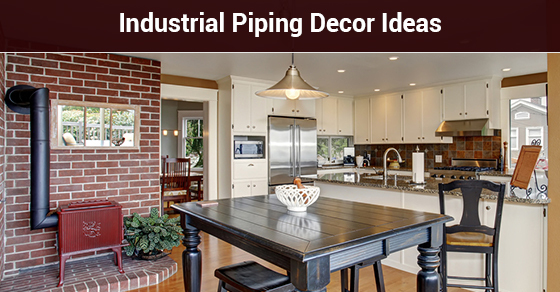 The industrial look incorporates wood, exposed brick and exposed pipes from plumbing and electrical systems. One way to achieve this look is with industrial piping from the hardware store. Here are four DIY ways to incorporate it into your decor (hint: all of these items also serve a practical purpose as well). You can use industrial piping to create a shelf (or even an entire shelving unit or bookshelf!) not only as a decorative item but also as a practical one. Indeed, many homeowners have a lot of underused vertical space in their home. Whether you install an industrial shelf in your living room, kitchen or bathroom, the options are endless. There are many online tutorials that will show you how to put together an industrial piping shelf, depending on what kind of shelf you want to install. The process is not only easy, but also only requires a few items: industrial piping, wood, a sander and a level. A plumbing pipe beach is relatively easy (and cheap!) to put together, making a great addition to your entryway or mudroom. All you need are some gas pipes, a piece of wood that is sturdy enough to sit on and a paint stainer. You could even use this same technique to create an industrial-looking kitchen table! If you are undergoing kitchen renovation services, now is the perfect time to change the look of your decor. Floor-length industrial lamps retail for as much as $400 to 1000, but with a few items you can make it at home yourself for less than half the price. The great thing about an industrial pipe lamp is that it adds a lot of moody atmosphere to a room. Whether you make a floor lamp or a table lamp, the process is fairly similar. Yet again, you can find in-depth tutorials of how to do this online. A more unique contender on this list is the industrial pipe plate rack, something you may not necessarily see in a lot of homes. It also happens to be easy enough for a beginner to put together at home. If you are in need of kitchen renovation services, contact our team of experts at Brothers Plumbing today. We have over 50 years in the industry and offer affordable rates.